A ninth grade student of the Diamond Secondary School explaining the importance of guarding against oil spills. A garbage bin that rewards users and research on agricultural uses for used diapers were among the distinctive projects on display at Region Four’s Biennial Science, Technology, Engineering, Arts and Mathematics Fair, which began yesterday at the Diamond Secondary School. An estimated 220 students representing nursery, primary and secondary levels from 47 schools are in competition. District Education Officer and coordinator of the fair Loren Park, commenting on the projects displayed, noted that while the ideas for the projects seemed repetitive, many of them were re-conceptualised and presented for the scrutiny of the judges. The host Diamond Secondary School is the school with the most entries this year, with 11 entries, followed by Hope Secondary and Annandale Secondary School. 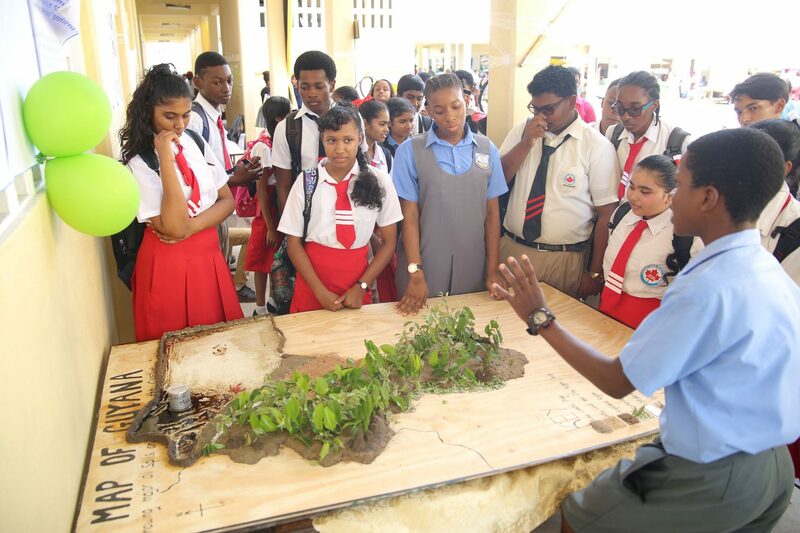 Based on observations made by Stabroek News during a visit yesterday afternoon, one of the pieces that immediately stood out was one entered by the Upper Secondary students of the Diamond Secondary, who presented a prototype of an “Electro Bin” designed to reward persons for proper disposal of their garbage. 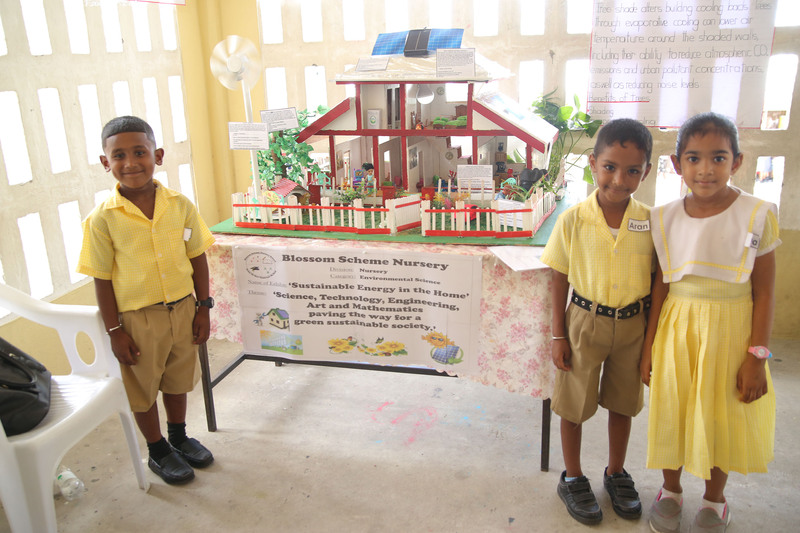 Students from the Blossom Scheme Nursery School with their project, which focused on sustainable energy in the home. 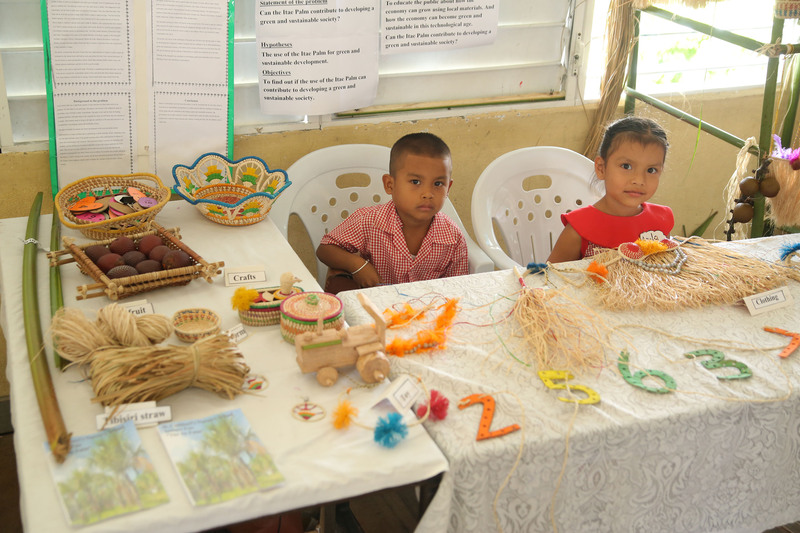 Pupils of the St. Cuthbert’s Mission Nursery School ready to share their display on the versatility of the Ite Palm. The female team representing the Lusignan Primary School displaying how a wind farm works. 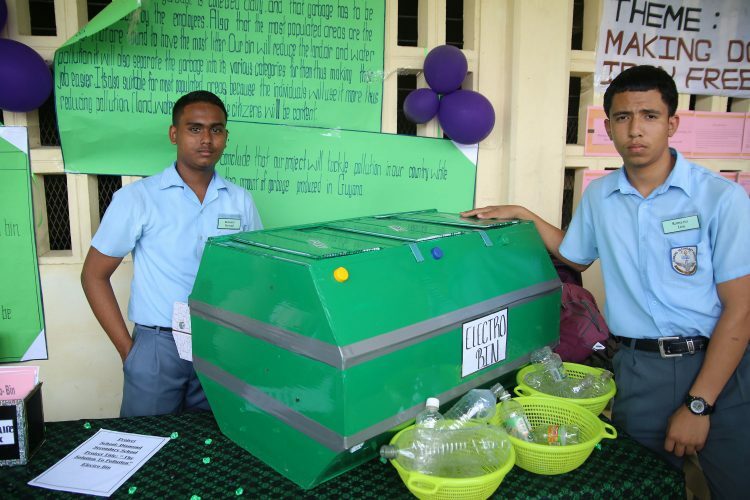 The Electro Bin prototype, designed by students of the Diamond Secondary School, rewards users. Laritta Glasgow (right) and another student representing the Soesdyke Secondary School with their project, which focuses on use of Super Absorbent Material found in disposal diapers for agricultural purposes. 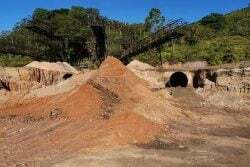 According to their research, Georgetown alone produces 300,000 pounds of garbage daily, all of which have to be separated into different categories by the garbage disposal companies. Simple by design, the bin would ultimately present the public with three categories for their litter, that is, glass, plastic and biodegradable material. “Let us say that Demico sponsors the bin, now the coin or ticket that comes out would entitle you to a free cone at Demico. 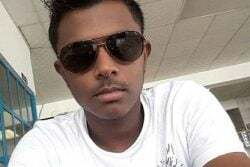 So, as you help us clean the environment, we reward you,” group member Romario Persaud explained. He also noted that the token would only be given if persons dispose of their garbage under the correct category since based on their prototype, a sensor will be implemented to alert the system of same. 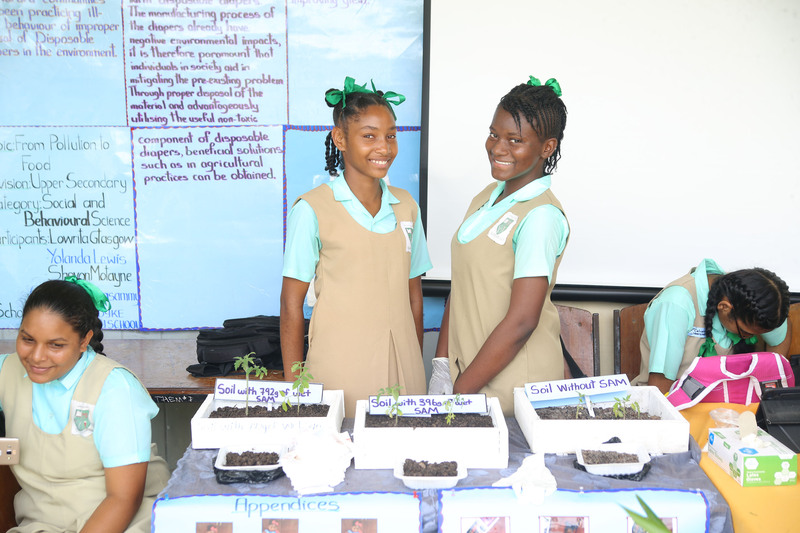 Several tables away were students from the Soesdyke Secondary School, who presented their research on the use of Super Absorbent Material (SAM) from disposable diapers in agricultural practices, including improving water retention to improve yield. In her presentation, group member Laritta Glasgow noted that the SAM in the diapers are non-toxic and bio-degradable and can be used to provide moisture for plants. She went on to explain that in the case of using material from urine soaked diapers, a table spoon of salt can be added to remove the urine while the SAM from diapers with faeces can be used as organic compost. Important to note, however, was that it should only be used on plants that are considered to be hard stem plants, such as cherry, coconut and banana suckers since they would not be susceptible to human pathogens that may be present in the SAM. Across the compound was another unique presentation which was entered by the Grade Nine Students of the Diamond Secondary School, who opted to highlight the need for preventative measures to safeguard against oil spills. 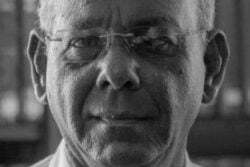 “The thing about this project and why it’s here is to enlighten us on this new journey that Guyana is embarking on. 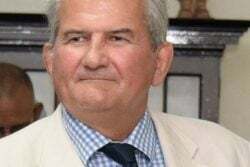 We need to understand that we need to prepare for it before it happens and as far as I can see, in my opinion, Guyana doesn’t look as though it’s ready for an oil spill , so we trying to enlighten you and show you that we have to start preparing,” a group member told Stabroek News. In the primary school range, several schools focused on food science and presented projects that featured interesting uses for foods, such as cucumbers and bananas as face and hair masks. Others, like first timers from the Lusignan Primary School and Hauraruni Primary School, focused on presentations relating to renewable energy and Math and Science, respectively. 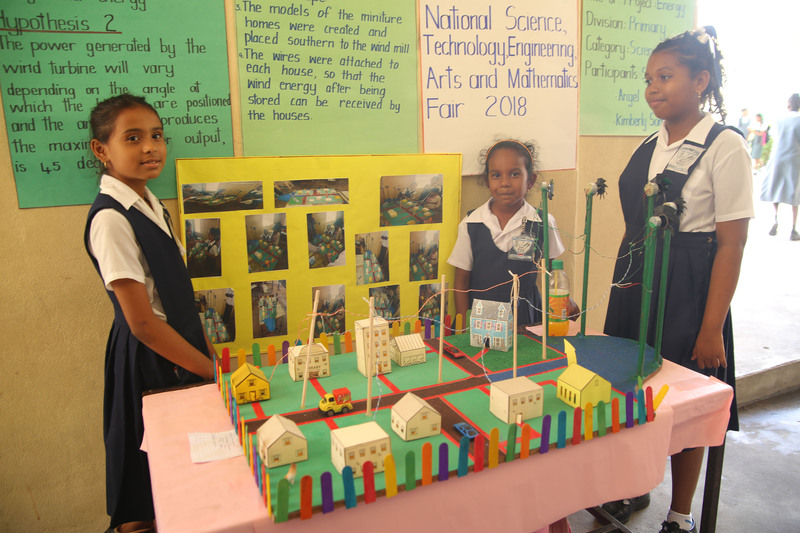 The eloquence of the three-member female team representing the Lusignan Primary School complemented the knowledge they shared when they spoke of their wind farm and its benefits for a budding green economy. In the nursery range, the students of St. Cuthbert’s Mission Nursery School and the Blossom Scheme Nursery School stood out, with their display of products made from the Ite Palm, and on renewable energy in the home, respectively. Other nursery-level entries focused on Science and Mathematics. With the inclusion of art in this year’s competition, there were few entries including one from the Diamond Secondary School, which highlighted the students’ attempt at sculpting and pottery. Also present at the fair were companies such as SOL and organisations like the Government Technical Institute and the Guyana Geology and Mines Commission, which also interacted with the participants of the fair. At the last fair, Diamond Secondary was crowned the overall winner of the competition, while President’s College occupied the runner-up spot and Annandale Primary placed third.